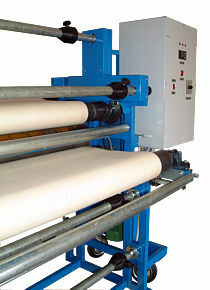 The rotary heat transfer machine is suitable for transfering sublimation inks to textile or for heating disperse inks on coated fabrics. 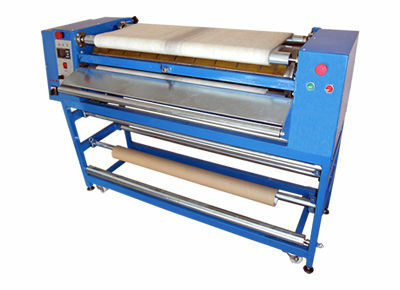 The machine is specifically designed to be used for roll-to-roll large format digitally printed sheets. 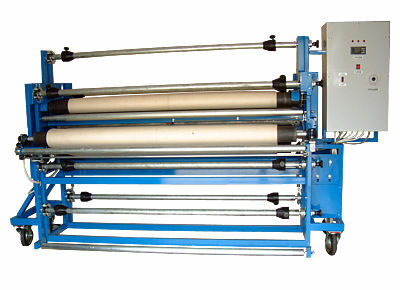 The calender is ideal for heat treating large format flags, banners, fabrics, etc. The temperature distribution is maintained across the width of the heated drum with triple zone heat control and drum speed and pressure are also adjustable. A Nomex felt band ensures that equal amount of heat is transfered to the fabric everywhere. 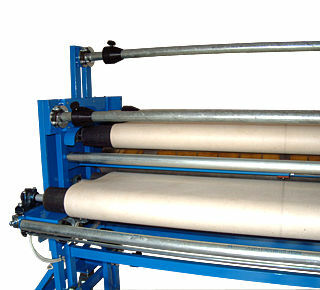 The calander type HV-500 is suitable for thermoprinting of ribbons or thin fabrics. Before the thermoprinting the ribbon on bobbin is placed on the machine stand. 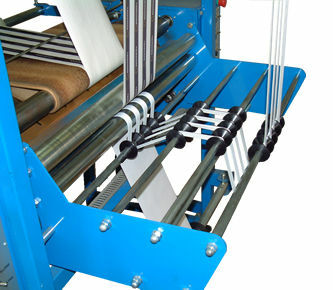 The ribbon passes throgh a series of stretch rollers after which it is pressed against the transfer paper - holding the sublimation inks - as well as the protection paper. 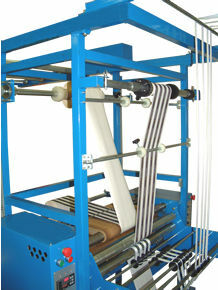 An endles Nomex felt transport belt clamps the materials to the heated ironongdrum and ensures sufficient compressing force. The separetely stored printed ribbons, the used transfer paper and the used protection paper are wounded onto diffrent drums. The edge controller ensures that the transport belt always remains in the right position.